Australia entered the Second World War with very few tanks and an urgent need for armored fighting vehicles. Although the primary opponent for Australian forces was Japan and their its small and thinly armored vehicle in the Far East, Australian forces would also serve throughout North Africa and later in Europe. By 1944, Australia had its own indigenous tank production capability in addition to British and American supplied armour to use. Together, this provided all the armor that Australia needed, and yet, despite this, there were inventors who sought to get their own designs into the hands of the Australian Army. Some of these inventions were reasonable, some not so reasonable, and many – the majority in fact – were totally unsuitable for modern warfare. The Puckeridge Land Battleship assuredly falls into this latter category. The critical weaknesses of current tanks were, according to Puckeridge, the exposed tracks and wheels, which were vulnerable to enemy fire, and Puckeridge had his own ideas for a new, war-winning weapon without these flaws. 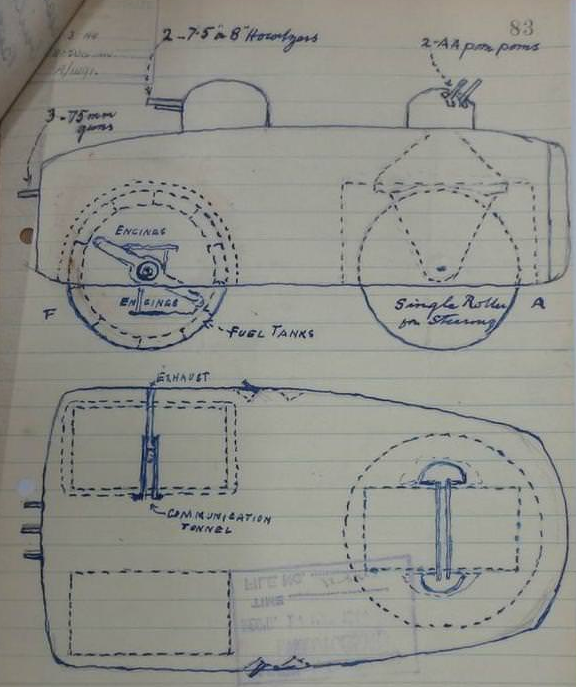 Mr. Fred B. Puckeridge of Port Lincoln, Australia wrote to the Australian Army in March 1944 submitting his idea and a rough outline for a ‘Land Battleship’ with the intention that these new ‘tanks’ would work in conjunction with existing tanks. Puckeridge, in his letter to the authrotities, claimed to have recently outlined his idea to the then Minister for the Navy W.M.Hughes on 8th November 1940, and that it was then sent on to technicians who did not approve of the idea as the vehicle was considered too large for Australian production. Puckeridge had hoped in 1940 that this idea would be passed onto Great Britain and the USA, although presumably, this was in hindsight, as the USA did not enter the war until December 1941. The Land Battleship was projected to be big. Very big. The whole vehicle was to move on rollers 40 feet (12.192m) in diameter and 20 feet (6.096m) wide. Three rollers arranged two at the front and one at the back. The rear one was used for steering, and all three were attached to the large body of the vehicle completing it at about 190 feet (57.9m) long and 70 feet (21.3m) wide. The armour was no less grandiose, consisting of 8-inch (203mm) thick plate at the front mounted on “heavy steel girder frame” and 4-inch (101.6mm) thick at the sides. Two gun turrets surmounted this machine with an 8 inch (203mm) and a 6 inch (152mm) gun as the main armament and two 7.5-inch or 8-inch howitzers in the fore turret. The rear turret was to be much less heavily armed, with just a battery of “AA pom-poms” for anti-aircraft use. Additionally, 75mm guns and automatic weapons were to be mounted along the sides of the hull. The engines were not to be mounted in the body, but were instead to be mounted inside the rollers and fixed permanently to the axles, which in turn were secured to the framework for the body of the vehicle. Using three engines (one for each roller) ensured that the loss of even two engines in combat would not cripple the machine. Communications and vehicle control traveled through these hollow axles to the engines with the exhausts being vented out of one side. Puckeridge felt that his design could be very effective in the jungle, for the clearance of jungle, constructing roads, and even as an amphibious fighter when the adequate modifications were carried out. Puckeridge’s somewhat impractically large roller-tank ‘Land Battleship’ received an assessment from the Australian military and by April 1944 had been quickly rejected for the second time. The specific reasons for rejection were the vulnerability of the driving mechanism by enemy fire, lack of maneuverability on land. Another complaint was the visibility – the design had large blind spots which meant the crew would have been unable to keep an eye on their surroundings. Although not mentioned presumably obvious problems like how to build and transport this enormous machine let alone its combat value (or lack of) were taken into consideration when it was rejected. The vehicle concept was seen as adding nothing new to the design of armored fighting vehicles from the point of view of the Army and received no more attention. With his idea rejected it would normally mean the end of the matter, but Puckeridge persevered and wrote back in July 1944. Taking the criticisms point by point, he now further claimed that this idea had been around for a long time, and that he personally had submitted a very similar idea back in 1884 to the then British Prime Minister, W.E. Gladstone. That idea was steam driven and was prompted by the siege of General Gordon at Khartoum in the Sudan. Later, in 1915, Puckeridge had again submitted a similar design to the British Board of Inventions powered by a diesel engine. his latter suggestion was rejected. Regarding the complaint about it not being as maneuverable as a ship, again Puckeridge argued pointing out that this design could, in fact, turn 90 degrees in a quarter of the time and in a tenth of the space of an ordinary seagoing vessel. Puckeridge’s design was large and typical of a type of large wheeled ‘tank’ which was seen on the drawing boards and in the fertile writings before the First World War. Despite his assertions that these rollers would be useful for flattening jungle, clearing and making roads, and even airfields, the giant-roller tanks were all seriously flawed in concept. Puckeridge’s grand idea had no effect on the war and got no further than his writings to the Army. The fact that he stuck to an idea from 1884 all the way into 1944 is a testament to his interest in the idea, as well as perhaps also an element of stubbornness to accept that the idea was a poor one. Armament : 8 inch (203mm), 6” (152mm) guns, two 7.5 inch or 8 inch howitzers in the front turret. Rear turret – battery of “AA pom-poms” for anti-aircraft use. 75mm guns and automatic weapons in hull. 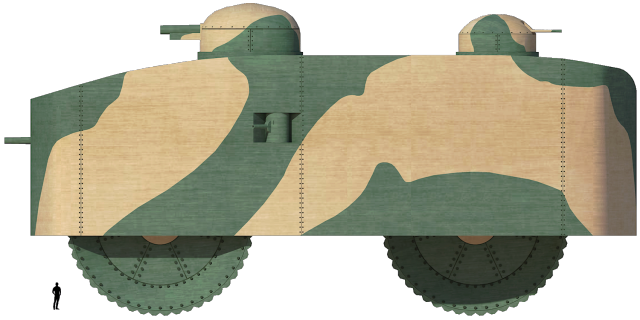 Illustration of Puckridge’s Land Battleship in a speculative camouflage. An average height man (1.7 meters, 5ft 9in) is standing in front of the vehicle for scale. Modelled by Mr. C. Ryan, funded by our Patreon Campaign. Now I am certain. You robbed a patent bureau! Melvaine’s Mobile Pill Box, Modra Revolving Light Tank, Cossor Land Cruiser, and now this. Steampunk never dies! Someone tried to recreate HG Well’s Land Ironclads.